As the administrator of an Oracle Management Cloud, you can deploy agents that can collect log and metric data from entities that you want to monitor and upload the data to Oracle Management Cloud. Here are some of the common terms and basic concepts regarding agent deployment and lifecycle management. Oracle Management Repository is a schema in an Oracle database where all the information collected by your on-premises Oracle Enterprise Manager Cloud Control Management Agents is stored. It consists of objects such as database jobs, packages, procedures, tables, views, tablespaces, and so on. The agent software ZIP file is a ZIP file that contains a software installation script and software binaries for agent installation. A registration key identifies the Oracle Cloud identity domain you have access to, and it is used to verify data sent by agents that are deployed on your on-premises hosts. You can use a single key for various agent installations. When you install an agent, you must provide the registration key value as a parameter. You can get the value of the key from the Agents screen of Oracle Management Cloud. A gateway is an agent that acts as a channel between Oracle Management Cloud and data collector or cloud agents. Multiple data collector or cloud agents can communicate with Oracle Management Cloud through a single gateway. A data collector is an agent that reads data from the customer’s on-premises Oracle Management Repository and uploads it to Oracle Management Cloud. A data collector also collects log information from entities. A cloud agent collects the host, entity, and log data from the host where you deploy the cloud agent. It can connect to Oracle Management Cloud directly or through a gateway. On-premises Oracle Enterprise Manager Agents are software components deployed on monitored hosts. They are responsible for monitoring and managing all of the targets running on those hosts, communicating that information to the middle-tier Oracle Management Service. A security certificate, or a digital certificate, is an electronic document that proves the ownership of a public key used for secure communication over a network. This graphic shows all the Oracle Management Cloud components and their communication flow. The components communicate with each other using https protocol, except for the data collector that uses SSH and SQL to communicate with the OMR. Software or hardware resources as well as business objects whose properties, configuration, status, and performance are tracked and analyzed are known to Oracle Management Cloud as entities. The cloud agents monitor and collect data (for example, metrics, configuration information, and logs) from entities that reside on hosts, or on virtual hosts in a cloud. Typically, you deploy cloud agents on the same hosts as the entities of interest. In some cases, cloud agents can also collect metrics for entities on other hosts using various protocols that allow remote connections. A gateway is an optional agent type. Even though cloud agents can directly transmit their data over the Internet to Oracle Management Cloud, for security reasons, many companies do not have all of their machines accessible on Internet. Since, they have limited set of machines accessible on Internet through a proxy in most cases, installing a gateway on such machines helps route the data from a set of cloud agents to Oracle Management Cloud. A gateway is installed on a host that has Internet access to Oracle Management Cloud and can be reached by all hosts where cloud agents are deployed. All Oracle Management Cloud agents can use a common gateway. A data collector is an optional agent type. It reads data from an on-premises Oracle Enterprise Manager Cloud Control Management Repository (OMR) and/or collects log information from the Cloud Control managed entities. The repository data and logs are then uploaded to Oracle Management Cloud. A data collector can communicate directly with Oracle Management Cloud or through a gateway or a proxy server. A data collector is deployed on a host with SSH and SQL access to the OMR. You must deploy a data collector only if you have an existing Oracle Enterprise Manager setup and you want to extract data or logs from it. Typically, a data collector is installed on the OMR host because it adds only a small amount of overhead. However, you can choose to install a data collector on a different host as well. The data collected can be used by the IT Analytics and Log Analytics services. Typical data centers will have a corporate proxy server or a firewall configured. If your organization has a proxy server set up, then you must provide the proxy details when installing agents. 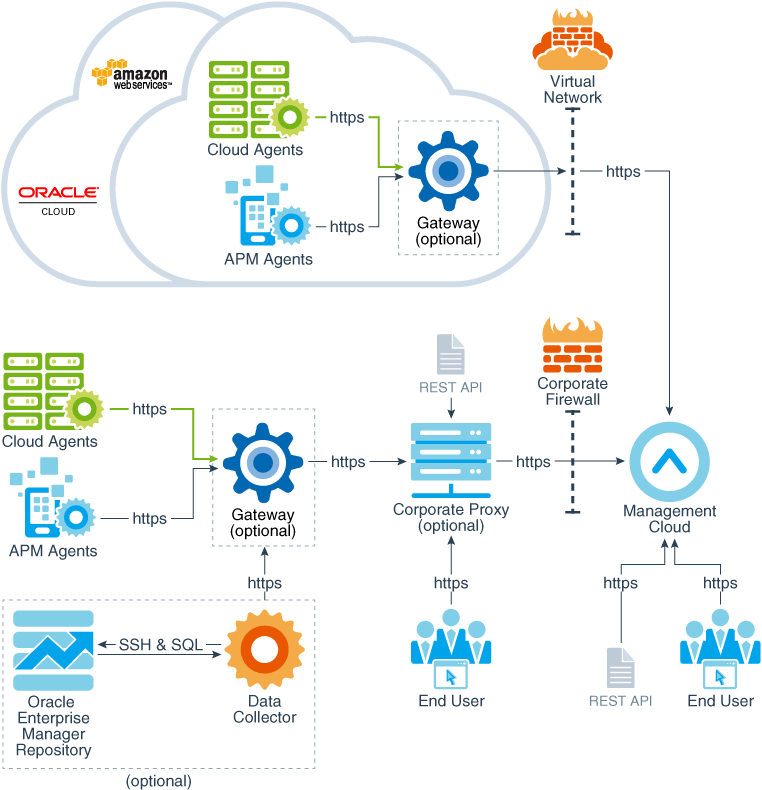 This enables the agents to communicate to Oracle Management Cloud over a proxy or a firewall. If deployed, a data collector collects different types of data from the Oracle Management Repository, including target properties, configuration and performance metrics, or events. When cloud agents are installed on hosts, they automatically detect these hosts as monitored entities. To enable monitoring, add entities to cloud agents and those entities are monitored by that particular cloud agent. Cloud agents then collect status, performance, and configuration metrics for these entities. Depending on their configuration, cloud agents also collect logs from their entities. The gateway authenticates cloud agents in the client security service layer. If the cloud agents are found valid, then it receives the data or logs from the cloud agents. The gateway uploads the data and/or logs using a data pipeline using a proxy/firewall, if it is configured, and stores them in the distributed file system of the Oracle Management Cloud. Individual Oracle Management Cloud Services receive data from the common distributed file system, and save the data in their own service schemas. This short video shows you how to install an Oracle Management Cloud agent. Perform the following tasks to install Oracle Management Cloud agents. Before you start installing Oracle Management Cloud agents, ensure that you review the generic prerequisites. See Generic Prerequisites for Deploying Oracle Management Cloud Agents. Evaluate the type of Oracle Management Cloud agent you need to install. You can install three different types of Oracle Management Cloud agents: Gateway, Data Collector or Cloud Agents. You need to decide which type of agent you want to install. See Understand the Architecture of Oracle Management Cloud. Download the agent software install ZIP file. The first step to deploy Oracle Management Cloud agents in your environment is downloading the agent software ZIP file. See Download the Oracle Management Cloud Agent Software. Create or download a registration key. You need a registration key to install a new agent. You can create a new one or you can also download an existing registration key. See Manage Registration Keys. The agent installer reads parameters specific to your environment from a response file. Response files (.rsp files) are included in the agent software install ZIP file and, depending on the type of agent you are installing, you customize them per your environment. See Understanding Response Files. Determine if using a gateway is appropriate for your environment with Understand the Architecture of Oracle Management Cloud. If it is not, skip to the next task Install a data collector. If a gateway is appropriate, then determine which gateway installation is best for your environment. A gateway is service agnostic. After you install a gateway, it works for any Oracle Management Cloud service. Install a data collector (optional). Determine if using a data collector is appropriate for your environment with Understand the Architecture of Oracle Management Cloud. If it is not, skip to the next task Install cloud agents. If a data collector is appropriate then determine which data collector installation is best for your environment. A data collector is service agnostic. After you install a data collector, it works for any Oracle Management Cloud service. See Install a Data Collector. A cloud agent is required to use Oracle Management Cloud. A cloud agent is service agnostic. After you install a cloud agent, it works for any Oracle Management Cloud service. Defining entities for monitoring and analysis. After you install agents, you must define and add the entities that you want to monitor. See Next Steps: Defining Entities for Monitoring and Analysis.